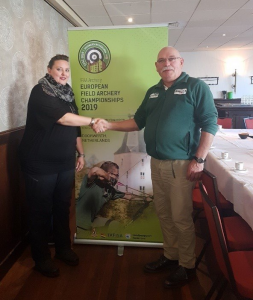 The organizers of the IFAA European Championships Field 2019 (EFAC2019) have consulted the organizers of the DUTCH OPEN IFAA tournament on Saturday, November 17, to coordinate plans and agreements. The cooperation with the DUTCH OPEN IFAA tournament is used by us to train our volunteers and test procedures, thereby also providing manpower. For the EFAC 2019 participants, this is the chance to achieve scores that meet the requirement to match at least 2 scores of an IFAA field when registering in August 2019. To be able to participate in the EFAC, a completed and signed qualification card is required. The score that stands for this must not be more than two years old. A blank qualification card can be requested from the national federation, affiliated with the IFAA, but must be applied for at the latest two weeks before the start of the competition. The qualification card must be signed in the shot weekend. The qualification card must be presented to the Shoot Director of the organization. At the same time all accompanying scorecards have to be shown for inspection. Without the presence of the scorecards the qualification card can not be signed off. The scores of the Field and the Hunter round are required to be submitted to the EFAC. The authorized person to sign is the Shoot Director, Mrs. W.G. Hunter (Petra). ATTENTION: the qualification card is not provided during the Dutch Open IFAA !!! For the activities related to the course, equipment, competition, etc., the co-Range Captians will be Mr. Bert Jager and Mr. Cristiaan Oortmann the contact points during the Dutch Open IFAA Tournament. For the organizational, administrative, participants, score processing, etc. Shoot Director Ms. Petra Jager is the contact person during the Dutch Open IFAA Tournament, she is supported by Mr. Lammert Jager in the Basecamp. For questions to / about / for the Dutch Open IFAA Tournament you can use the email address (contact@dutchopenifaa.nl) or use the contact form.